Tricia and Pete DeMaio know the heartbreak of abortion all too well, and twice over. Growing up in southern New Jersey, the high school sweethearts found themselves expecting a baby in their senior year. Although they eventually planned to marry, both were too terrified to let their parents know that Tricia was pregnant. Frightened, Tricia leaned on Pete to manage the situation. “I felt like he was running the show, that he would take care of me,” she said. Pete followed the advice of his peers: he arranged for Tricia to have an abortion. “We know now that we didn’t make the right decision,” Tricia said softly. Two decades later, the DeMaios now work to educate others about the suffering inflicted by abortion, sharing their story through several pro-life organizations — including Project Rachel, the Catholic Church’s ministry to those who have been involved in abortion. In the Philadelphia Archdiocese, the ministry was established in October 2016 as a collaborative effort between Catholic Social Services and the archdiocesan Office for Life and Family. Led by Estela Reyes-Bugg, a social worker with more than 20 years of experience, the archdiocesan outreach offers pastoral counseling by trained clergy, individualized therapy and retreats such as Rachel’s Vineyard. Fluent in both English and Spanish, Reyes-Bugg also focuses on making Project Rachel’s resources available in a number of languages. “My mission is to offer hope to all who have suffered from abortion,” she said. Hope was something that the DeMaios needed in the days following their first abortion — and their second. After high school, Tricia studied nursing at Villanova University, while Pete majored in finance at St. Joseph’s University. They continued their relationship and, on the surface, appeared to excel. Inside, though, both grieved deeply over their lost child; Pete sought solace in alcohol and drugs. In their junior year of college, Tricia once again became pregnant. This time, still reeling from their high school experience, the couple decided to tell their parents, and Tricia’s mother gave them some stern advice: have an abortion. After the second abortion, Tricia and Pete graduated, began working and remained a couple — defying the odds in the process, given numerous studies that have documented the negative impact of abortion on partner relationships. The grace of God was actually at work in their lives, said Pete. But it took one more tragedy for them to realize that: as the couple settled into their careers, Pete’s mother and brother were both diagnosed with cancer. His brother’s case was terminal, and sorrow opened Pete’s heart to a relationship with God. “I started going back to church, and I learned to love Tricia properly through the experience of my brother being sick,” Pete said. At a family dinner, and with his own death imminent, Pete’s brother minced no words. Galvanized, the couple quickly began planning a wedding, hoping Pete’s brother would live to attend it. While his mother survived her bout with cancer, Pete’s brother died in August 2003, just three months before Tricia walked down the aisle. Grief accelerated their spiritual renewal. During a 2004 men’s retreat, Pete went to confession and on returning home encouraged Tricia to do the same. The sacrament was “a game changer” for them, as was their introduction to “Humanae Vitae,” Pope Paul VI’s 1968 encyclical on human life, including artificial contraception. The couple immediately discontinued their use of the birth-control pill; Tricia became pregnant a month later, and their oldest son was born on Mike’s birthday. 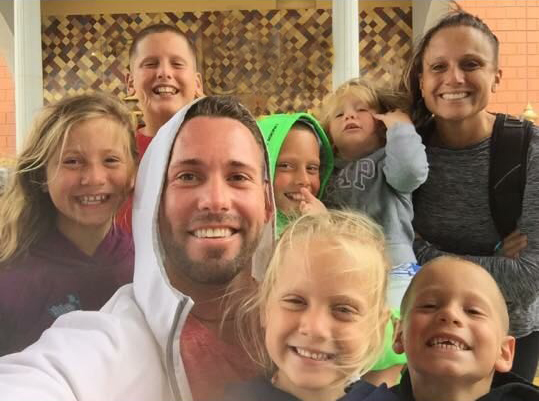 The couple’s family grew rapidly, and 15 years later, the DeMaios are now expecting their seventh child (two died as a result of miscarriages). “Some people try to make you feel that children are a burden, but we wouldn’t trade a single one of them,” said Tricia. In speaking to area youth about the sanctity of human life, the stages of prenatal development, and their own devastating experiences with abortion, Tricia and Pete stress the importance of grace and hope. “Through Project Rachel, we can help others to see that they can have everything, that God can restore them to wholeness,” Pete said. God Bless you both and thank you for your courage. Hooray for the courage of Pete and Tricia to share a tough story. Their story should give hope to others who once made a sad decision. I think I know this family pretty well and all I can say is wow! My respect for them increases each time I talk to them and so much more now. God bless you and please keep up the wonderful work you do.